We are getting close to the holiday season, less than 3 weeks till Christmas. In town you see the lights in the street, the show windows display the offers for this festive season. The sound of Christmas music when you enter the shops. We are getting inspired to decorate our homes, we start looking for gifts and what to put on the menu for Christmas eve, Christmas day and maybe even the days following until the New Year. While choosing the menu we can think of the table setting and table decoration. Once you realize that the table setting is based on logic, things become less intimidating. Special occasions, like Christmas, require a more formal table than the traditional five-piece place setting. You get stressed by the idea? You shouldn't: once you've learned the essentials of a well-set table, you can apply them or break them according to your style, personality or menu. This will remind you of your first time in a nice restaurant and you had no idea which fork or knife to use? 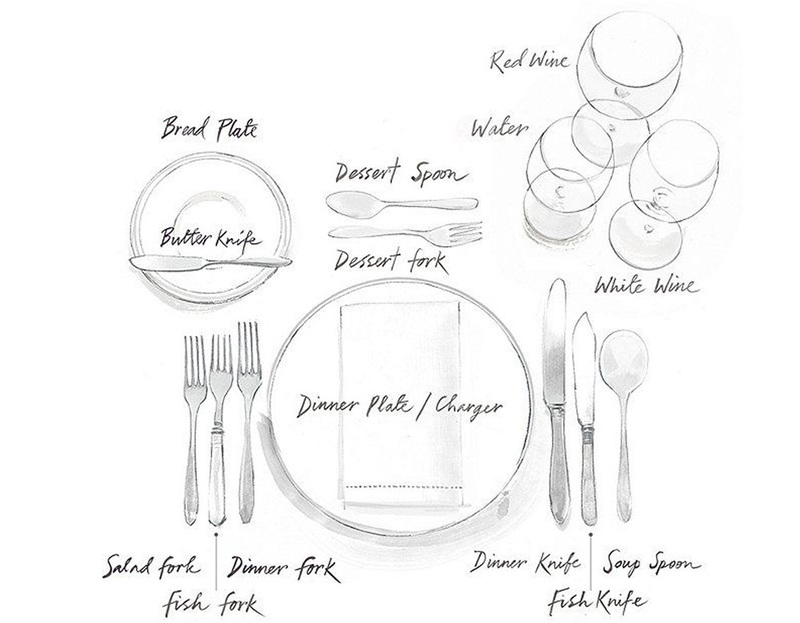 It is easy: you begin eating a meal by using the flatware at the outside left and right, and work towards the plate as the meal proceeds. Dessert spoon and dessert fork are put on top of the plate. A small plate with knife sit above the plate and to the left: this is the bread-and-butter plate and butter knife. Every glass has its place. By now you should see that you can't go wrong. A nice decorated table makes every occasion special, not just Christmas, when we make an extra effort. Beautiful napkins in cotton jacquard, linen, embroidered. Silver cutlery, crystal glasses. We can go for a beautiful floral center piece or just a small touch around the napkin, this touch of green will make it festive. Christmas is one of those occasions to take out the beautiful cutlery, maybe you have some inherited from your grandmother. Every dish has its fork and knife, right as we know it from those romantic movies or when we eat in an exquisite restaurant. For those who like a more relaxed celebration they can go for a casual table setting. 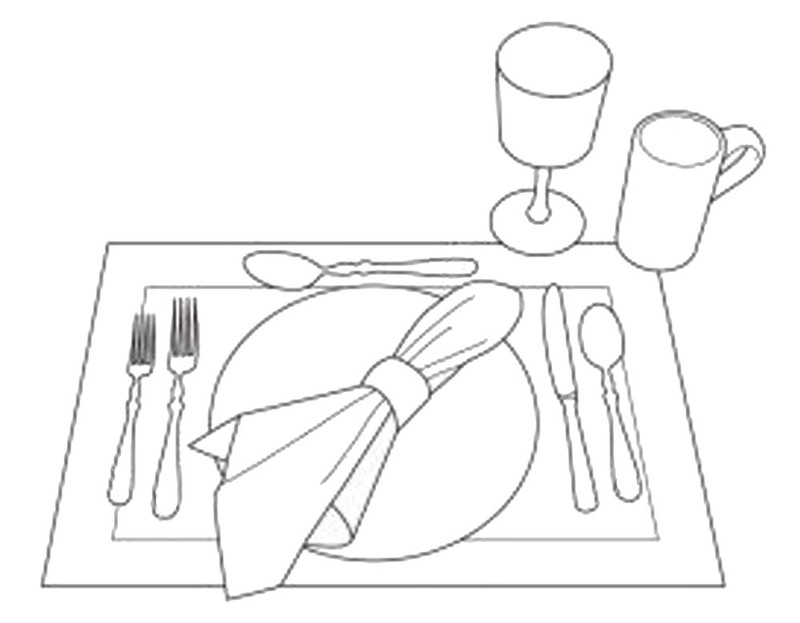 Informal settings generally have fewer utensils and dishes but use a lay-out based on more formal settings. When you have small kids in the family, or those formal dinner parties are not your style, you can add some colour on the table. When we take a look on the images from Maramures and we see their colourful traditional outfits we see the joy which come from it. Christmas is a time to be thankful, time to enjoy being around the table with family and friends. You have a large family but not 12 plates of each set? Is just perfect to create a more bohemian look. Colourful plates, mix-and-match designs, some embroidery, colourful flowers, candles, striped napkins: the more you mix the better the look gets. Handmade napkin rings in wooden beads, around colourful cotton napkins, and padded placemats with scibble embroidery are perfect for kids. At Christmas most of us have a small or longer holiday, time to sleep longer now the days are short. Time for relaxed lunch with friends. The table setting now can be very casual, a small touch will still make the difference. When the carol singers come back home, after they went around in the village singing from house to house, they arrive with a bag filled with apples, round pretzels, and nuts, perfect to make an original center piece on the lunch table, combined with wooden candle holders. Linen table cloth and napkins give a more rustic but still elegant look. Linen was one of the most common materials used in the past. Simple white plates, and colourful recycled glasses. Traditional folk art include wood carving, ceramics, weaving and embroidery of costumes. The Romanian traditional blouse has been an inspiration for painters and artists, and still is. Hand painted ceramics are reflecting the spirit of those embroideries we see all around the country in Romania. Black is the most common colour used, but red and blue are predominant is certain areas. Traditional motifs, and colours, a modern approach for the ceramics made by The Awesome Project. Dinner is almost done, bread-and-butter plate, butter knife and wine glasses will be cleared, leaving the table set for dessert. A small dessert plate arrives along with a coffee or teacup and teaspoon. Now is time to use the spoon and fork, which were on top of the setting before the meal began. Not only dessert: enjoying a home made cake on a Sunday afternoon. Music and dance represent a lively part of the Romanian folklore and there are a great variety of musical genres and dances. I love to use on special occasions the embroidered tables clots, old spoons, and decorative porcelain I got from my grandmother. These things make the difference, they give an extra depth to those days, they make me feel at home and loved. You have a list in your head of things you want to do during the holidays, or even for the whole month of December? You got inspired last week for the Christmas decoration in your home? It gives us joy just thinking of them. Maybe you have some real family traditions, or as we've seen last week in Maramures: they start with cleaning the house, the pig which is slaughtered and than the food preparations. One thing which makes me think of Christmas is the smell of cookies, the pine tree or a potpourri. I started making one last weekend, very easy you just let is simmer for hours on the stove and the whole house smells incredible. In case you are going to do some shopping put those ingredients on your list and you will find on Half Baked Harvest how to make your house smell like Christmas. Get inspired and enjoy the Christmas preparations.